Is Your Commercial Kitchen Ready for a Restaurant Inspection? | Flue Steam Inc.
Is Your Commercial Kitchen Ready for a Restaurant Inspection? 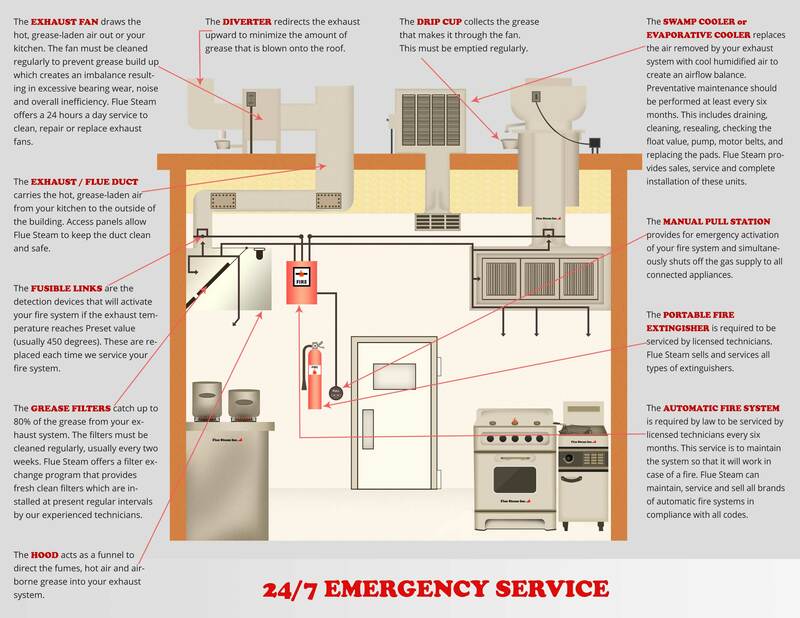 Flue Steam provides important services that help your kitchen pass the fire safety portion of a restaurant inspection. As the owner or operator of a commercial kitchen, you have countless regulations to comply with as to the condition of your facility, the behavior of your employees, and your food handling practices. With so many rules and requirements, the potential for surprise restaurant inspections by the health or fire authorities to result in a citation or even the temporary closure of your kitchen is very real. Fortunately, you can get expert help with the fire safety portion of a restaurant inspection from Flue Steam. Here are the key areas that can trip up a restaurateur and result in a citation or failed inspection. The facilities of any restaurant need to be in a clean and sanitary condition. This includes the floor, ceiling, and walls of the dining area as well as the kitchen. Various amenities such as the employee restroom, the hot water, the plumbing in general, and the electricity also need to be in reliable working order. Plus, there are also additional requirements regarding the posting of menus with correct and accurate nutritional information. It can take quite a lot of training to drum all the food safety requirements into your employees’ heads. Some requirements, like washing hands before and after handling raw meats and not cross contaminating surfaces, utensils, and containers with different raw meat products are common sense. Others, like not storing raw foods above ready to eat foods, are a little harder to remember because they aren’t something people worry about in private kitchens. In a commercial kitchen, there is a significant risk of fire associate with all the cooking that goes on, especially if lots of foods are fried, grilled, or otherwise prepared in a way that tends to release a lot of greasy vapor. Commercial kitchens are required to take certain steps to guard against the risk of fire in general and grease fires in particular. Flue Steam can help with many of these activities. For example, we can ensure that your kitchen exhaust hoods remain free of dangerous amounts of grease buildup with hand scraping services. We can also help remove grease deposits that may have migrated further into the exhaust ducts with steam cleaning services. For maximum efficiency, we recommend hand scraping every month or so, supplemented by steam cleaning several times per year, depending on how much greasy food you cook in the kitchen. Flue Steam can also install and service fire extinguishers and automatic fire suppression systems. We provide dated stickers each time we service these kinds of equipment to make it easy for you to prove that you’ve fulfilled your fire suppression obligations during a visit from the fire inspector. Call Flue Steam today to schedule service, and help improve your chances of passing your next fire inspection with flying colors.